Michigan State University appears in our ranking of the Top 15 Online Adult-Gerontology Clinical Nurse Specialist (AG-CNS). Each course, even those in the business core, is tailored specifically for the healthcare field. The course modules are broken up into five five-week chunks, and all material is available 24/7 to make sure that even third-shift workers already in the healthcare industry can better their education. The courses cover a gamut of business topics, including information systems, law, economics, and collaborative leadership. In keeping with a 21st-century, forward-looking mindset, all courses focus on critical thinking as a foundation of both learning and applying what has been learned. 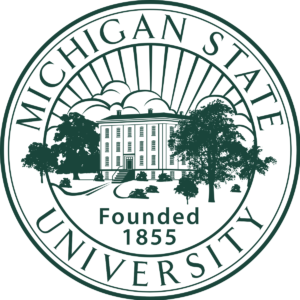 Michigan State University offers an ultra-competitive certificate program at its Flint, Michigan, campus for undergraduate students in their third and fourth years at the College of Human Medicine. It’s called Leadership in Medicine for the Underserved. The program only accepts 18 students annually. Students must be bilingual in both English and Spanish. The certificate program focuses not only on the medical side of the equation but also on the implementation of services, often from scratch, and the managerial challenges that come with them in remote rural and inner-city areas and also along migrant routes. Michigan State University was founded in 1855 as the Agricultural College of the State of Michigan. It was the first university in the United States to teach scientific agriculture. The campus expanded through both land grants and funds allotted through the Morrill Act of 1862. The university has come a long way from five teachers and 63 students in its first year of existence. Now, it is the size of a small city, and more than 50,000 graduate and undergraduate students study there, pursuing degrees in more than 200 programs. The university has received a No. 85 ranking among National Universities from U.S. News and World Report. The Broad School of Business, where healthcare management graduate students study, is No. 1 in the country in the teaching of supply logistics and No. 7 in the country in teaching management of all kinds. When it comes to teaching veterans, the university is ranked No. 49. All of Michigan State University’s online programs are ranked in the Top 50 nationally. Students wishing to pursue a Master of Science in Healthcare Management must be already employed in some capacity in the healthcare industry, which can include the subfields of insurance and public policy. They must also have achieved at least a 3.0 GPA in the final two years of their undergraduate study at a regionally accredited college or university in the United States or a foreign equivalent. Students must also show that they have at least a reasonable chance to advance in their companies. Students must bear in mind, however, that meeting the minimum requirements is not a guarantee of admission. The Office of Admissions will consider a student’s entire record, including transcripts, letters of recommendation, required essay or essays, and resume. The tuition for the Master of Science in Healthcare Management is $950 per credit hour. That comes to a total of $39,900 for the entire course, not including books, other materials, and fees. The fees will vary from student to student, and the books, materials, and fees will be billed separately. All students requiring financial aid should begin with the Free Application for Federal Student Aid. When completing the FAFSA, students will include all of their financial information and, if relevant, that of their parents as well. The university and the government will use the form to determine a student’s financial need. The three general types of aid are loans, grants, including work-study, and scholarships. Not every student will qualify for every kind of aid. Loans are separated into two categories: subsidized and unsubsidized. A subsidized loan is one where the government covers the interest while the student is enrolled. If a loan is unsubsidized, not only does the loan accrue interest while the student is enrolled, but that interest also accrues interest on itself. Scholarships and grants don’t need to be paid back in the same way as loans, but some have stringent academic requirements to maintain. Should a student fail to meet those requirements, those grants or scholarships may turn into loans. Often, those would be unsubsidized loans. Students wishing more information should contact the Financial Aid Office. Aside from need-based financial aid, students may also qualify for merit-based aid. Most of the time, merit-based aid comes from private entities, such as foundations, memorial funds, and the like. In some cases, merit-based aid is not available if the student receives substantial need-based aid. To find out more, students should contact the organizations that provide the merit-based aid directly. Of course, students can secure loans from private lenders like banks or credit unions, many of which have student loan programs. Most students combine different forms of financial aid to meet their obligations. Michigan State University has provided students with top-quality education for more than 160 years and is always looking ahead to find new opportunities to better not only itself but also the education it provides.